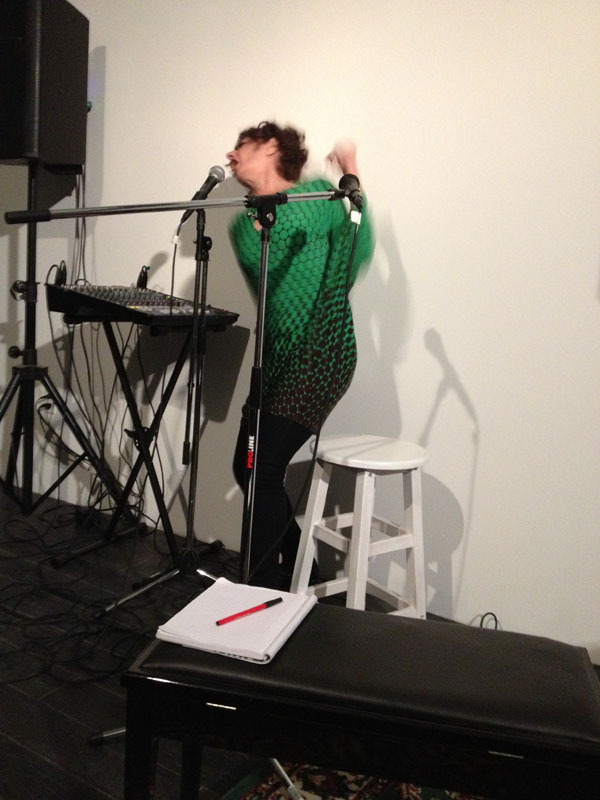 The 2013-14 season of Musical Ecologies begins Thursday September 12 with composer/vocalist Shelley Hirsch. A Brooklyn native and living legend of the “Downtown” musical avant-garde, Hirsch will present Tohuwabohu, a 20-minute sound piece in two-channels, and a duo performance built around samples of Bernard Herrmann film scores with Michael Evans on theremin and percussion. Described by the artist as a “choral” piece, Tohuwabohu was originally created as a 5.1 surround sound piece for an installation with Ursula Scherrer called Alga at the Minoritan Church in Krems Austria. It was subsequently adapted for KunstRadio/Radio Orf in Vienna, and extended to 8 channels for a recent presentation at Harvestworks. Tohuwabohu is a Biblical Hebrew phrase found in the Book of Genesis. It is usually translated “waste and void,” “formless and empty,” or some variation of the same. It describes the condition of the earth before God said, “Let there be light”. In German it implies chaos/void, in French, commotion. Hirsch has been performing The Bernard Herrmann Project since 2004 with selections of the late, great composer's soundtracks solo, and in collaboration w/ visual artist Jim Hodges and video artist Ilan Katin and theremin player Pamelia Kurstin in New York at Roulette, Tonic and Le Poisson Rouge; in Germany Comic Meets Theater Festival in Halle and Tesla in Berlin; in France at Musique Action, Vandoevre-Les Nancy and The Institute For Living Voice in Marseille France and elsewhere. For the Canadian festival Electric Eclectics this year, Hirsch invited Michael Evans and Lary 7 to join her and add incidental sound to the tracks as well as to play improvised interludes which link the pieces. For this performance Hirsch and Evans will perform in duo. Shelley Hirsch is an award winning, critically acclaimed vocalist, composer, improvisor and storyteller whose mostly solo compositions, staged multimedia works, improvisations, radio plays, installations and collaborations have been produced and presented in concert halls, clubs, festivals, theaters, museums, galleries and on radio, film and television on 5 continents. She has received numerous awards, grants, fellowships and residencies including 4 NYFA Artists’ Fellowships; a Creative Capital grant; the prestigious DAAD residency in Berlin; The Ucross/Alpert Residency Prize; 2 NEA grants and a record 5 Artist In Residencies from Harvestworks Studio PASS. Hirsch can be heard on 70 recordings including her own most recent cds "Where Were You Then?" songs and story's co-composed with keyboardist Simon Ho on Tzadik and improvised music cds with guitarist Uchihashi Kazuhisa on Innocent Records; "Berlin/Brooklyn" with turntable player Joke Lanz on Rossbin and "Walking and Stumbling Through your Sleep" w/ Koch/Schuetz/Studer on Intakt. Christian Marclay a longtime collaborator, made the piece "Zoom! Zoom!" as a duo improv for Marclay's Onomatopoeia'ic slide projections and Hirsch's voice/text.They have performed it at The Louvre Museum in France, The Whitney Museum in NYC and more. Hirsch has performed and or recorded with dozens of musicians worldwide including Christian Marclay, Butch Morris, Fred Frith, Fred Lyenn, Barbez, Dafna Naphtali, Billy Martin, David Watson, David Weinstein, Anthony Coleman, The Shaking Ray Levis, Okkyung Lee,Tony Buck, Matthias Bauer, Phill Niblock and Chantal Dumas (both w/ video artist Katherine Liberovskaya), Konk Pack, and Andrew Lafkas. Michael Evans is an improvising drummer/percussionist/ thereminist/composer whose work investigates and embraces the collision of sound and theatrics. While his primary instrument is an unconventionally altered drumset, his work with unusual sound sources includes found objects, homemade instruments, the theremin and various digital and homemade analog electronics. He has worked with a wide variety of artists of all sorts including Ron Anderson, Jeff Arnal, Jac Berrocal, Carla Bley, James Chance, Martha Colburn, Lol Coxhill, Ken Filiano, Chris Ferris, Michael Gira, Gisburg, David Grubbs, Alexander Hacke, Jarboe, Pamelia Kurstin, Gen Ken Montgomery, Aimee Mann, Karen Mantler, Sean G. Meehan, Gordon Monahan, Evan Parker, Andrea Parkins, William Parker, Yvette Perez’s Birdbrain, Elliot Sharp, LaDonna Smith, Peter Zummo, John Zorn and many others. Upcoming on Musical Ecologies: Steve Dalachinsky & Carver Audain (10/10); Travis Just (11/7) Michael Lowenstern (12/19) and JD Parran (1/9). Comments closed — Trackbacks closed RSS 2.0 feed for these comments This entry (permalink) was posted on Friday, August 30, 2013, at 8:27 am by Dan Joseph. Filed in press release.